The Best Kept Secret in the Business of Ideas! I hope you are keenly aware that you’re in the idea business. Ideas are the intellectual content of everything we do and money tends to flow towards great ideas. Social media is how you share those great ideas and get the money flowing. The ideas you share may be unique new concepts that you developed or, as is often the case, they’re ideas you’ve collected from many sources and are now presenting with your own personal flair or impression of how they can be used by others. If you understand the true foundation of your business is ideas, then it’s vitally important you have a system in place to collect them or, as I like to call it, trap them! Trapping ideas is the vital step that takes an idea from the ethereal to a concrete reality. Would you like to know the secret system that many of histories greatest achievers used to trap their ideas? Thomas Edison had 3500 of them! Leonardo da Vinci’s filled 7000 pages and Bill Gates just bought one of da Vinci’s for 30.8 million dollars! Darwin, Einstein, Tesla, Samuel Morse, Charles Dickens, Lewis and Clark, all used them. What is the secret system – it’s a hand written journal. Many of the greatest creators and achievers throughout history understood the power of collecting their thoughts and ideas, as they occurred, in their journals! 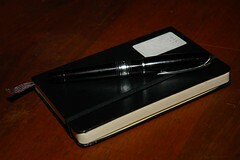 Journaling is one of the best kept secrets that can give you an edge in the idea business. Why do I say it’s a secret? It’s a secret because so few people take the time to keep a hand written journal or get in the habit of using them on a regular basis. In his book, The Slight Edge, author Jeff Olson describes how in most cases the things that make a dramatic difference in our life are those little things that are easy to do but also easy not to do. It’s easy to find time to read 15 minutes each day. It’s also easy to just watch TV instead. The dramatic difference in the outcome of those two opposing habits can only be appreciated as the years go by. In the moment of choice, the two alternatives do not appear to be significant. The same can be said for journaling. It’s easy to write down your inspired thoughts and ideas if you have a journal in easy reach. It’s also easy to simply say “I’ll just remember my ideas and don’t need to write them down.” Without a system in place, and due to the weakness of our short-term memory, our unwritten ideas often simply vanish. Histories great achievers understood this dynamic and wrote extensively in their journals. They captured their observations, ideas and thoughts and let them coalesce into powerful concepts, inventions, literary masterpieces and dramatic works of art. Do you think that people like Edison and da Vinci are too old school? Are you thinking that if they were alive today they would be journaling with a keyboard or on their iPad? Then let me cite a powerful modern-day example. I think we can all agree that Sir Richard Branson is a current success story. His Virgin brand encompasses over 100 different companies and products. In his book, Losing My Virginity, he had this to say: “my most essential possession is a standard sized school notebook…I write down all the comments made to me, notes of all telephone conversations and meetings, drafts of letters and list of calls to make.” He then describes his vast library of completed journals that he has kept since his teens. He regularly goes back to those journals and reviews them for ideas that were incomplete at their inception but are viable now with his expanded resources. Journaling is powerful because writing makes you focus your thinking as you go through the intricate hand motions of manipulating a writing instrument. Writing is also a powerful activator of the brain. Writing by hand tells the brain “this is important” and the brain acts in accordance to that command in ways that dwarf typing! It is a brain building exercise according to today’s leading neurologists. If you want to take advantage of this “best kept secret” and begin trapping your ideas it’s easy to get started. Simply buy several of the notebooks you would use in an English composition class. They are typically offered in 80 page versions and are available anywhere school supplies are sold. Don’t buy a fancy one! Your journal should not be a work of art. You shouldn’t be afraid to get it dirty. You need to have it with you anywhere you go if you’re going to get the most benefit out of it. Once you have your journal you should begin by dating each entry and then just start writing. The big question that comes up at this point is “what should I write?” You will answer that question in your own way eventually. For now just write out what you want to accomplish today or who you plan to talk to. Write down any thoughts or ideas that may come up as you talk to people or read various materials. You will develop your own system as you make a journal part of your daily routine. Throughout history great things have occurred from the habit of writing down thoughts and ideas as they occur. It empowers the brain to think more. If you’re in the idea business, get in the habit today of trapping those ideas in a hand written journal. Don’t be surprised if all of a sudden you find yourself coming up with an abundance of ideas that create powerful outcomes in your life and the lives of those you influence.